There’s a lot of (mis)information out there about what trails in the Cinque Terre are open or closed at the moment, so I’m hoping to clear up any confusion. The most famous hiking path in the Cinque Terre is the Sentiero Azzurro (the so-called “blue” coastal trail that connects all five villages, also known as SVA). There are currently two sections of the coastal trail that are open (the sections between Corniglia and Vernazza and between Vernazza and Monterosso) while the other two sections are currently closed. Let me break down the four sections of the coastal trail for you and give you some details for each one. Riomaggiore to Manarola: The famous Via dell’Amore (Lovers’ Lane) which can be classified as a walk or stroll (not a hike) has been closed since 2012 due to extensive landslides. There’s no hope of it reopening in 2017 as no works are currently in progress (thanks to a lack of funding and Italian bureaucracy *sigh*). Learn more about the Via dell’Amore here. Alternate trail: At the moment, the primary alternative trail between Riomaggiore and Manarola (called the Beccara, trail #531) has been closed to the public due to pending litigation (more details on that can be found here). While super steep and intense, the Beccara was a straightforward way to hike between the two villages. My friends at Cinque Terre Trekking in Manarola have mapped an alternate route (albeit longer and not so direct) for avid hikers wanting to connect between the two villages (see below). Starting on trail 501 in Riomaggiore (you’ll find the trailhead behind the village’s castle) connect to trails 530 – 532 – 532C – 502 – 506V – 506. This loop is circa 5.8km (3.6 miles) with 420 meters of positive elevation gain. If you’re on Instagram, I recommend following @cinqueterretrek for gorgeous Cinque Terre trail photos and some inspiration! Manarola to Corniglia: This portion of the coastal trail has been closed since 2011 due to landslide; at this point we do not have an expected reopen date. However, don’t be discouraged as the alternative trail for this portion of the coastal trail is actually one of my favorites (and is actually much more beautiful than the original!). Alternate trail: via Volastra (trail 506 to 586 to 587) From Manarola, trail #506 makes its way up the hillside, climbing through the terraced vineyards. Once you’ve reached Volastra (a beautiful little village off of the sea) the trail connects with trail number 586 and takes you through the olives groves and then descends down into Corniglia on trail 587. As Corniglia is already located up off of the sea, the descent isn’t too steep. This alternate route between Manarola and Corniglia takes roughly 2 to 2 1/2 hours (diffulty level: medium to difficult). TIP: Keep in mind that the most difficult portion of this alternate route is the section of trail 506 (as this is the incline from sea level in Manarola up to 333 meters/1,094 feet above sea level in Volastra). If you prefer, it is possible to catch a bus from Riomaggiore (two per day during peak-season) or Manarola (multiple buses each day) to Volastra and hike the latter two trails to Corniglia. Corniglia to Vernazza*: This portion of the blue coastal trail (SVA) is currently open and takes approx. 1 1/2 hours to hike (difficulty level: medium to difficult). As you approach Vernazza you’ll have some stellar views over the village! Vernazza to Monterosso*: This is the most difficult portion of the coastal trail (not counting the alternate route between Riomaggiore and Manarola). Approx. hiking time is 2 hours (difficulty level: strenuous). *Keep in mind that in order to hike the Sentiero Azzurro a special national park hiking pass (€7.50 per person, per calendar day) must be purchased. In alternative, you can purchase the Cinque Terre Card (€16 per person, per calendar day) which will include not just the hiking along the coastal trail, but also unlimited trains for the day between the villages as well as use of the buses in the villages. See more details about the different passes available by clicking here. Only the coastal trail (Sentiero Azzurro) requires payment. All of the other trails (including the aforementioned alternate trails) can be hiked free of charge. I’m oftentimes asked about the status of the Cinque Terre trails because people have heard that the majority of the trails are closed. FALSE. Out of a total of 48 signmarked trails in the Cinque Terre, 5 are currently closed. FIVE. But don’t take my word for it, you can see for yourself on the Cinque Terre National Park website. No matter how long your stay, there’s plenty of hiking to be done here! While we’re on the subject, I recommend reading my post on the 8 things you need to hike the Cinque Terre. This is hands down the best and most thorough information on the current trail situation in the CInque Terre – brava Amy! If I were still working in the tourist industry in Riomaggiore, I would photocopy this and hand it out to all my guests. A must-read for anyone visiting the area right now! EXCELLENT! I spend a lot of time unsuccessfully trying to find the ‘true’ status of trails and recommended alternatives routes before I found your simple but very informative guidance. Thank you very much. Note that the website address provided for the mobpark parking in La Spezia does not work – at least today. We felt disappointed when we found out about the closed coastal paths, so I’m really glad to find out that there are aternate routes. Volastra sounds amazing in your othr posts. Sincere thanks for this blog, it’s wonderfully helpful. I’m planning a hike across the 5 villages around Oct 10th. And I’m wondering what’s the current status of the Via dell’Amore and the rest of the paths between the villages. Are they all open? I’m unable to get a clear report elsewhere. Also, my research tells me that October is the rainiest month in the year for Cinque Terre, is that true? I did the trek on my own 15 years ago in July, and now I’m taking my family there to enjoy the beautiful villages and food! So I really hope we’ll get the chance to do the hike when we’re there. Thanks again for this blog and for your help.. Thanks for reading! The blog is up-to-date for the status of the trails (click here to see the most relevant post). A brief summary of the coastal trail is as follows: the Via dell’Amore (which connects Riomaggiore and Manarola) is closed (but the alternative Beccara trail is open, although it’s quite strenuous! ), Manarola-Corniglia is closed (but the alternative hiking up through Volastra is open and highly recommended! ), Corniglia-Vernazza is open, Vernazza-Monterosso is open. All of the other secondary trails are currently open so there’s definitely plenty of hiking to be done! I personally wouldn’t classify October as the rainiest month of the year in Cinque Terre. Actually, it’s usually a beautiful month! Of course, it can rain, but to me I think of November as the month when the weather turns cold (and rainy). 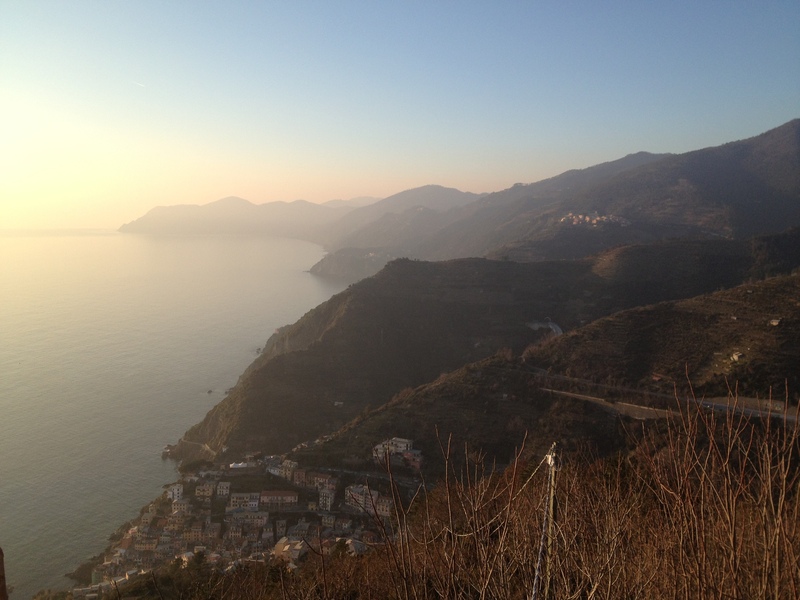 Do you recommend we hike from Vernazza to Monterosso or vice versa? Are they both equally challenging and rewarding either way? Perfect information, exactly what we were looking for after trawling through website after website to find any decent information. Off to start from Corniglia to Monterosso tomorrow and really looking forward to it! Thanks a million. Which village were you hoping to stay in? Are you arriving by car or train? Fantastic information , thank you , we are coming the second week of May and are really excited ,we are staying in Corniglia and are fit walkers ,we walk a lot and are really looking forward to getting around mostly by foot . when the trails are described as difficult etc is that because they are strenuous or because they are very scary eg are they super narrow giving you the feeling that if you put one foot wrong you will fall off the cliff ! Hope this doesn’t sound silly ! thank you Clare. The Cinque Terre trails are usually considered difficult because there are steep climbs and descents on a rather rugged footpath (packed dirt and stone). While there are a few portions of the coastal trail that may get your heart pumping due to being right on the cliffs, the paths are safe so long as you are vigilant. If you have a fear of heights there are trails that are higher up on the mountainside that still offer beautiful views. Thank you Amy , that is good to know . we are looking forward to using some of your eating recommendations when we are there , I am also hoping in May it won’t be as crowded ? and are looking forward to swimming in the sea , although I know it will be chilly , do others swim in May ? May is really when thinks start picking up in the Cinque Terre. The water temps will be chilly but you won’t be the only one swimming (I was at the beach last weekend and some visitors were already in the water!). Thanks for the trail information, its great. We are booked in Riomaggiore in July before we realized the locations of the trail closures. Although we are hikers we were hoping to move easily between the villages. It seems we may be taking the bus/train more often than we expected. Do you recommend any tips? We are wondering if we should stay in Riomaggiore or try to find a place in Vernazza or Monterosso instead? Any recommendations on best ways of moving around the villages? How many nights have you booked? Keep in mind even with the Via dell’Amore closed there are still lots of other hiking trails from Riomaggiore. Also, with trains leaving every half hour in both directions during the day it’s really easy to go between the villages. We have booked a few nights in Manarola but I just found out that the trails out of there are closed. I don’t mind using the trains a bit more, but my plan was to do some photography, and I wanted to stay in one of the villages so I could do some sunset and sunrise photography from the trail viewpoints without having to worry about taking a train at those times. I was debating Manarola or Vernazza and picked Manarola, but it appears I may have made the wrong choice. I particularly wanted to get the classic view of Manarola from slightly up the trail toward Corniglia, just after sunset. Do you know if it’s possible for me to still get the photo of the town from that classic viewpoint?